It’s Thanksgiving! Let’s Not Go Shopping! It’s Thanksgiving! Let’s Not Go Shopping!. Was it really necessary to start Black Friday a few hours earlier into Thanksgiving? According to an article by the New York Times posted Sunday, opening stores on Thanksgiving diluted Black Friday sales. Will this cause the retailers who opened their doors on Thanksgiving to re-think their strategy? I hope so, but I doubt it. Ironically, the store that brings the country the Macy’s Thanksgiving Parade was not open on Thanksgiving. To the retailer’s CEO, Terry J. Lundgren, Thanksgiving is about family and of course, the retailer’s Thanksgiving parade. He placed a higher value on allowing more employees to have the day off to be with their families instead of trying to bag extra sales. If anything, the retailer could be more tempted to be open to the thousands who attend the parade. Good for him. And good for Macy’s. His patience seemed to have paid off. When Macy’s opened its flagship Manhattan store at Midnight, deal hunters quickly filled in record numbers. Could it be that his stance turned out to be the best marketing approach after all? Could it be that this act of goodwill became a brilliant public relations strategy? That is not the only thing Macy’s is doing right while other merchants are struggling. Despite a pullback yesterday, its stock continues to outperform the S&P 500 Retailing Industry Group. The merchant that has given us the tradition of the Macy’s Thanksgiving Day Parade is also one that is helping to preserve the holiday. The CEO was upholding an important part of Thanksgiving that money cannot buy: spending time with loved ones. Such time is harder to find amid longer workweeks necessary to stay employed and purchase Christmas presents. I am pledging not to purchase anything from these stores this Christmas. My suspicion is that Macy’s will do just fine this year sans being open on Thanksgiving. Citing figures from the National Retail Federation, the Times reported that average Thanksgiving weekend spending for retail in general rose from $423 from $398 last year. With the average family income on decline and double-digit unemployment in many areas of the country, the only explanation is consumers bought on credit. And that is just what this country needs, more personal debt along with growing Federal debt. I am sad that a holiday President Lincoln set aside during the Civil War for Americans to count their blessings is becoming shopping day. (see http://wilstar.com/holidays/thankstr.htm) Given the recent election, it is clear our nation is deeply divided once again. Given this, it seems to me that Americans need a day to come together and count our blessings more than another shopping day. But alas, I have been called old-fashioned before. To protest the retailers who opened their stores on Thanksgiving, I am pledging not to purchase anything from these stores this Christmas. Please consider doing the same. Washington D.C. is being enveloped in nature’s simple beauty. Pinkish white canopies of cherry blossoms gently sprinkle to a white carpet of wonder. The buds have peaked earlier than usual this year in Washington, D.C., blooming with the promise of spring. Dark-suited power brokers, dreamy couples, stroller-pushing mothers, tourists and joggers…are all awestruck. And, we all stop, even for a moment, for the welcome respite from the pressures of relentless traffic, unforgiving deadlines and endless meetings.We have to. For this moment does not last long. The peak is a moving target of about three days amid the randomness of March through April with an average ETA of April 4th. Fully blooming blossoms unfold spring’s hope of new beginnings. 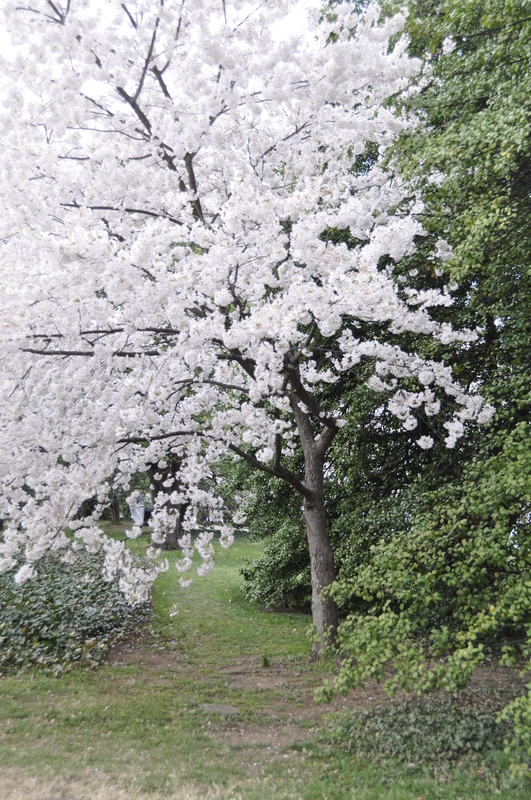 The blossoms faithfully appear every year, but too often, weather is not in sync with nature. The fickleness of spring sometimes robs us of these delicate treasures. This is my 16th full spring in Washington. And more than once, I have seen freezing rain rip blossom and branch and strong winds dissipate the splendor. It seems Washington has only about 40 truly nice and comfortable days each year. Even as they bloom, the days can be cold, wet and cloudy. You can catch the cherry blossoms before and after peak, but the scene is not quite as majestic. Washington is generally more out of sync than weather and nature. In this town of conflict, we cannot even agree on why weather appears to be getting more out of sync. In this town of power, we lack the power to create the moment when nature and weather merge in ultimate beauty. As we wait, Congress debates the nation’s fate. Value-conflicted Washington mothers watch how their children play. Budget battles ensue from the kitchen table to the White House. But there is something magical about those cherry blossoms. Then the perfect moment comes. Fully blooming blossoms unfold spring’s hope of new beginnings. As we share nature’s beauty, there is a wonderful, quiet moment, when Washington stands still. We are reminded that there is something bigger than day-to-day hassles and clashes of destiny. And we are all a part of it. And today, without a media campaign or pomp and circumstance, the sun did arrive. And in that moment, Washington shines its brightest.